For a printable version of the report, click here. For a two-page summary, click here. The Center first started looking into the matter of the child care shortage in 2015. In the process of this initial research, we found a corresponding shortage of information on just why providers were leaving the business. As a result, we concluded in 2018 that it was necessary to conduct a survey that would allow us to hear directly from providers themselves, both family and center-based. 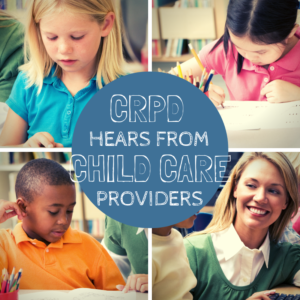 The goal was to look deeper into the issue by asking providers themselves what’s going on. From 1,500 surveys sent out to both family providers (those offering child care in their homes) and center-based child care providers, we received just under 400 responses. Providers were asked a combination of questions regarding finances and regulations to gauge how much each might be playing a role. While there were a few surprises, the responses from these providers confirmed what we have been hearing. Their comments provided numerous specifics to help direct efforts to fix the issues. This survey is not the final word, of course. We will take what we learned from this round to develop questions we will ask in focus groups later around the state this year to dig deeper into the particular issues raised by this survey. The two main areas of this survey asked about finances and regulations to see how each might play a role in why providers are leaving the business. The survey results showed, however, that regulations and finances are entwined, it seems especially for center providers. One finding that doesn’t immediately seem to relate to regulations or finances is how long providers intend to continue providing child care. Reponses confirmed what staff at the Minnesota Department of Human Services and others have known for a while: family child care providers tend to not stay in the business very long and apparently don’t plan to. When asked how long they intended to continue operating their child care business, family child care providers (FCC) were far more likely to say they planned to stay in business for less than ten years, while a majority of center child care providers (CCC) said they planned to stay in business for ten years or more (Figure 1). This is important information for Greater Minnesota because of the larger dependence on family providers. Around two thirds of the child care capacity in Greater Minnesota is provided by family providers, while only 30% of capacity in the Twin Cities metro is. The finding raises the question of why family providers have this short timeframe and whether they should be encouraged to stay in the business longer or if communities and the state should simply work with this fact. Among center providers, 35% in Greater Minnesota and 28% in the Twin Cities said they were somewhat dissatisfied or very dissatisfied with their financial sustainability compared to 21% and 14% of family providers respectively. Why are center-based providers feeling an apparent financial uncertainty when it comes to the sustainability of their businesses? Respondents were asked if changes in regulations were affecting their ability to operate their businesses, and if so, how? In response, both groups described a high hassle factor with existing regulations (time equals money) and a punitive atmosphere, but center providers commented more on the way they see regulations adding cost to their operations. Increased training, fines, requirements on equipment, toys and use of staff time were all factors mentioned. This issue is addressed further below. Is operating a child care business more difficult today? We asked providers about four different factors affecting their child care businesses—cost of operating; finding and hiring help; having enough time to get necessary things done; parents’ ability to pay a rate that is sustainable for you—and whether these factors are making it more difficult, less difficult, or about the same to operate their businesses today compared to five or ten years ago (Figure 3). Both groups in both regions found the cost of operating more difficult compared to five or ten years ago, but providers in Greater Minnesota responded “more difficult” at a higher rate than providers in the Twin Cities. Centers seemed to find everything more difficult at a higher rate than family providers. Family providers stated that things are more difficult (except for hiring staff, which generally doesn’t apply to them), but center providers cited almost all the categories as more difficult. The response on the question of parents’ ability to pay was not as dramatic as the other questions, but still, half or more of respondents in three of the categories (family and center providers in Greater Minnesota, center providers in the Twin Cities) reported that parents’ ability to pay was making doing business more difficult today. Twin Cities family providers came in at 45%. Figure 3: For each category, would you say it is making it more difficult to operate your business today than five or ten years ago, less difficult, or about the same? *A large number of FCC respondents, about a third, did not respond to the hiring help question, presumably because family providers do not generally have staff and therefore it did not apply to them. Staffing: A problem for centers. As the chart on finding and hiring help shows above, one of the overarching pictures to come out of the survey results is the scale of the problem centers are having with staffing. The essential message from many center providers’ comments was that a steady raising of educational standards and requirements for child care staff has in effect reduced an already tight pool of qualified staff, and they are not able to pay enough to compete with other businesses and with school districts. The problem of competition for an increasingly scarce workforce also includes the issue of benefits. We asked providers if, out of the revenue they make from their businesses, they are able to buy for themselves (FCC) or staff (CCC) any benefits (Figure 5). Center providers were largely able to provide paid time off, including salary to staff for attending required trainings. Figure 5: Family providers were less likely to have benefits and more likely to check “none of these.” Center providers in Greater Minnesota were more likely to report paying mileage to attend trainings. Health insurance was another matter: 57% of Twin Cities center providers and only 38% of Greater Minnesota center providers reported being able to afford health insurance. Although we didn’t ask center providers specifically what they pay their staff, anecdotally it appears to be around $10-$12 an hour. Combined with required education levels and the challenges of providing benefits to employees, it is understandable how centers would have a difficult time competing with other employers for workers. In general, family providers agreed more with the statement “Changes in rules and regulations are making it difficult to operate my business,” but both groups were quite vocal in their comments about the impact of regulations. Statewide, more than 80% of family providers strongly or somewhat agreed with the statement, compared to 68% for center providers. When asked how regulations are making operating their businesses more difficult, 72% of family child care respondents answered the question, as did 60% of center providers. A punitive and overzealous regulatory system leading to a fearful atmosphere of stress, frustration and burnout. “The fear of constantly having to worry about how your licensor is going to interpret rule 3. It varies so much licensor to licensor. I’ve gotten cited for things that aren’t even in rule 3.” —A center provider in Greater Minnesota. Excessive required training or training repeated too often for skills already learned, leading to increased expenses. Keeping up with the paperwork and frequent regulatory changes eating up precious time and money. “We have a full-time person just to keep up with the ongoing paperwork and trainings.” —A center provider in the Twin Cities. “New rules and regulations always come with a cost…” —A center provider in Greater Minnesota. For center providers, regulations were a major factor making it more difficult to hire staff. “Staff requirements are more strict, causing more staff training requirements and smaller pool of qualified staff…” —A center provider in Greater Minnesota. Those few who defended regulations stated that regulations are there for a reason and that they had no trouble following them. —A family provider in Greater Minnesota. A theme that came out repeatedly in the comments was that providers felt the job of keeping up with changing regulations was stealing time from being with the children they were caring for, thereby diminishing the profession they love. “With all the changes going on it has taken away with what I loved about my job. The children are the ones missing out the most.” —A center provider in the Twin Cities. Center staff will continue analyzing the data and comments in the several open-ended questions on the survey. We hope that between the survey data presented here, the survey data yet to be presented, and the information we collect in conversations with providers later this year we will be able to develop a better-focused picture that will help solve this child care conundrum.